Christina Aguilera has released the full video for her feminist anthem, 'Fall in Line', featuring Demi Lovato. 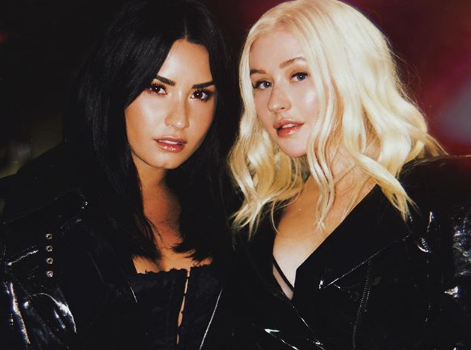 Christina Aguilera and Demi Lovato are following up their epic performance at the 2018 Billboard Music Awards with the official video for their collaboration, 'Fall in Line'. The girl power anthem is off Christina's upcoming 'Liberation' album, which is due for release on June 15. With lyrics like, "Little girls, listen closely/ 'Cause no one told me/ But you deserve to know/ That in this world, you are not beholden/ You do not owe them/ Your body and your soul", the song has proven a hit with feminists around the world. Demi recently revealed that it was an honour to work with Xtina on such a special song. "I hope you love this song as much as I do. It’s such an honor to lend my voice to this anthem for women with one of the most inspiring individuals I’ve ever met," she wrote on Instagram. Christina just dropped the song's official video on YouTube.